NEW ORLEANS, Louisiana, January 3, 2013 (ENS) – Transocean Deepwater Inc. admitted violating the Clean Water Act and will pay $1.4 billion in civil and criminal fines for the April 20, 2010 explosion, fire and oil spill involving the Deepwater Horizon in the Gulf of Mexico. The criminal information and a proposed partial civil consent decree to resolve the U.S. government’s civil penalty claims against the Swiss company were filed today in U.S. District Court in the Eastern District of Louisiana. The world’s largest offshore drilling contractor, Transocean leased the mobile offshore drilling unit Deepwater Horizon to BP for exploration of the Macondo well. Transocean Deepwater Inc. has signed a cooperation and guilty plea agreement with the government, also filed today, admitting its criminal conduct. 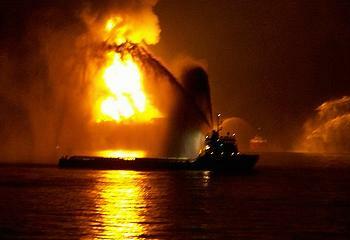 On April 20, 2010, while stationed at BP’s Macondo well site 40 miles southeast of the Mississippi Delta, the Deepwater Horizon rig experienced an uncontrolled blowout and related explosions and fire, which resulted in the deaths of 11 rig workers and the largest oil spill in U.S. history. Transocean Deepwater Inc. agreed to plead guilty to one misdemeanor violation of the Clean Water Act for negligent discharge of oil into the Gulf of Mexico. Transocean admitted that members of its crew on board the Deepwater Horizon, acting at the direction of BP’s “Well Site Leaders” or “company men,” were negligent in failing fully to investigate clear indications that the Macondo well was not secure and that oil and gas were flowing into the well. As part of the plea agreement, Transocean Deepwater Inc. has agreed, subject to the court’s approval, to pay $400 million in criminal fines and penalties and to continue its on-going cooperation in the government’s criminal investigation. In addition, Transocean Ocean Holdings LLC, Transocean Offshore Deepwater Drilling Inc., Transocean Deepwater Inc. and Triton Asset Leasing GMBH have agreed to pay an additional $1 billion over a period of three years to resolve federal Clean Water Act civil penalty claims for the massive, three-month-long oil spill at the Macondo Well and the Transocean drilling rig Deepwater Horizon. Under the civil settlement, the Transocean defendants also must implement court-enforceable measures to improve the operational safety and emergency response capabilities at all their drilling rigs working in waters of the United States. “This resolution of criminal allegations and civil claims against Transocean brings us one significant step closer to justice for the human, environmental and economic devastation wrought by the Deepwater Horizon disaster,” said U.S. Attorney General Eric Holder. Transocean will pay a fine in the amount of $100 million within 60 days of this agreement receiving U.S. federal court approval. The Transocean subsidiary will also be subject to a statutory-maximum term of five years of probation. Additionally, Transocean will pay $150 million to the National Academy of Sciences over a five-year period for the purposes of oil spill prevention and response in the Gulf of Mexico. Transocean will also pay $150 million to the National Fish and Wildlife Foundation over a three-year period. These funds will be directed to natural resource restoration projects and coastal habitat restoration, including restoration of the barrier islands off the coast of Louisiana and diversion projects on the Mississippi and Atchafalaya Rivers. The company also has agreed to implement measures to prevent a recurrence of an uncontrolled discharge of hydrocarbons, which must be submitted for the government’s approval within 120 days of this agreement taking effect. Examples of these requirements include certifications of maintenance and repair of blowout preventers before each new drilling job, consideration of process safety risks, and personnel training related to oil spills and responses to other emergencies. These measures apply to all rigs operated or owned by the Transocean defendants in all U.S. waters and will be in place for at least five years. Any potential claims associated with the Natural Resources Damage Assessment process are excluded from the agreement with the Department of Justice. But the district court previously held that Transocean is not liable under the Oil Pollution Act for damages caused by subsurface discharge from the Macondo well. Assuming that this ruling is upheld on appeal, Transocean’s liability would be limited to any such natural resources damages arising from the above-surface oil spill.